This is the first story in Greg Weisman's new series about a young girl who sees the dead. I love that the story takes place near the Bermuda Triangle. This is a great book, easy to love. An excellent page-turner for your young up and coming paranormal loving kids or any adult to likes a little escape. There is adventure, mystery, lovable characters. The downside of getting to read great books early is having to wait a bit longer for the next release date. I can't wait for the next installment. Both my older kids are fighting over who gets to read it first. Sorry no spoilers, guys, you'll have to read it yourself! I read that this series is slated to have nine books…I can see all nine of them on my book shelf in the future. I would definitely recommend reading. Disclosure: All opinions are my own. 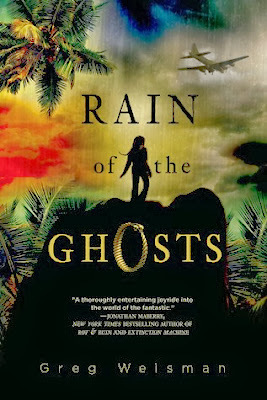 I received Rain of Ghost at no cost for the purpose of this review. No other compensation was received.